The Silk Road stretched as far as the imperial capital Xi’an in China, and this route traces the caravan trail back to its origins: ancient China. Here is a journey taking you across a rift between civilizations: get ready for a culture shock, several times over. The high Tien Shan mountains were the watershed between the Soviet and Chinese empires. They are also the divide between the intensely cultivated Ferghana Valley and the green uplands of Kyrgyzstan on the one hand, and the scorching heat of the Taklamakan desert on the other hand. You may have visited China before, but you likely haven’t been to this China. This is not the super-rich, hyper-paced, first-tier China of the east coast. Western China is a place that even few Chinese can imagine; a place of minorities, adobe architecture and Muslim piety. Sure, there are gleaming new highways and bullet trains, but eagle hunters and shepherds all the same. China is an assault on all the senses, even more so when coming from peaceful Kyrgyzstan. 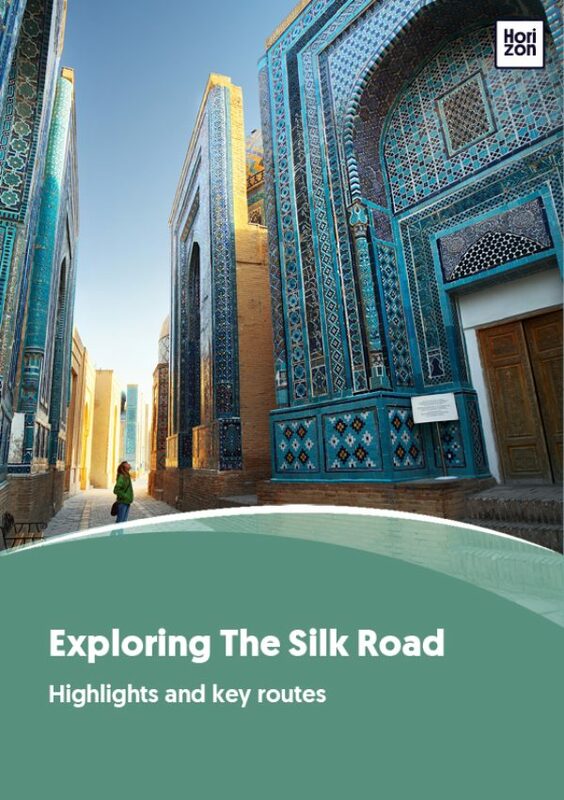 Combined with the Persian heritage of Uzbekistan, it is hard to imagine an itinerary richer in contrasts, juxtaposing tradition and modernity at every step. This tour begins with the general pattern of the Uzbekistan Loop (px). Start in Tashkent before taking the train down to Samarkand and onwards to Bukhara. From Bukhara, instead of pushing west to Khiva through the desert, return to Tashkent, either by fast train (four hours) or overnight train (nine hours). Leaving the well-worn tourist trail, Uzbekistan gets even more colourful, more traditional and more busy as you traverse the Ferghana Valley. If you only have one day, take the new train straight to the border town of Andijan, and stay the night in Osh. With an extra day, go by car. Popular stops include the royal palace at Kokand, the silk bazaar at Margilan and ceramic workshops at Rishton. Expect a riot of colour. Osh is an interesting town in itself, with its holy mountain overlooking the sprawling bazaar. Most exciting however, is the hinterland. It does not take long before you are in mountaineering terrain. Yurt-stays can be organized in cooperation with local community-based tourism projects to get a taste of the nomadic Kyrgyz lifestyle. Hikes and horseback rides in the surrounding Pamir-Alay range look out over summits like Peak Lenin, towering over the landscape at 7,134m (23,400 ft). It takes a full day to cross from Osh to Kashgar, and it is a road trip like no other. The Irkeshtam pass that separates Kyrgyzstan from China ranks as one of Central Asia’s most atmospheric border crossings, standing shoulder to shoulder with evocative names like the Khyber Pass and the Karakorum Highway. This is rough, high, lonely terrain: Marco Polo was not enjoying himself here. Only the big-horned sheep that carry his name seem to be comfortable at this height. Do not worry: a warm jeep and a blanket should be enough shield you from the cold, so you can enjoy the views along the way. Entering China, it’s immediately clear that you’re stepping into a very different world. The great Silk Route city of Kashgar, a base for commerce and cultural exchange for countless centuries, is perhaps the most interesting and exciting city in western China. Its celebrated Sunday Market, a chaotic mix of people and animals, is the single most captivating event in Xinjiang and thoroughly justifies the great distances crossed to reach it. Find out more about the Uyghur culture or seek out Tajik and Kazakh rural people still living a way of life that was long stamped out across the border by the Russians. It’s a wonderful thing to suddenly drop into a different culinary tradition. The stand-out dining option in Kashgar is grand Altun Orda, famous for its traditional Uyghur cuisine. It’s wonderful, if a bit touristy. If you prefer an altogether more ‘authentic’ experience, the night market across from the central mosque is the place to be for a sensory overload of flavours and smells. Kashgar connects by flight to a host of gateway cities across Asia, from where you can make your way home. Wish to see more of Xinjiang province? Then follow into the footsteps of great explorers like Aurel Stein and Sven Hedin to discover the Buddhist treasures hidden deep in the Taklamakan desert. Turpan’s Thousand Buddha Caves and the stupas and shrines around Hotan lead the way to the eventual end point of the Silk Road: imperial Xi’an, proudly guarded by its army of terracotta warriors.